There are good and bad times to visit major amusement parks, and a weekend day in the middle of August would normally fall into the latter category. Given the anticipated crowds I'd put aside money for a pair of Gardaland Express wristbands in the weeks before our trip so that Megan could ride everything on her first visit to the park, but it quickly became obvious that they wouldn't be necessary; overcast skies and a forecast of rain had kept people away. Throughout the day the wait times for major coasters peaked at no more than fifteen minutes, a wonderful stroke of luck that made for one of the best "big park" days I've had in quite a long time. Our early arrival meant we had a prime viewing location for the park's opening ceremony which began with a number of costume characters adopting solemn poses on the roof of the entrance gate to the accompaniment of the Italian national anthem, a rather jolly tune that I've always thought of as a potential entry to the Eurovision song contest rather than an instrument of statehood. The multitudes today paid it scant attention, though they did seem somewhat more enthusiastic when a Gardaland-specific track came on, accompanied by an elaborate dance routine. In due course the barriers were raised, paper streamers were shot into the sky, and fifty coaster enthusiasts began an undignified power walk to the brand new coaster. Oblivion: The Black Hole (#2142) can be found in the north-west corner of the park in an area roughly bounded by Space Vertigo and the Flying Island. The entrance reuses an existing building for an elaborate enclosed queuing structure that features an enormous number of orange LEDs, full height projections, LCD screens, and, in an unintentional display of equal opportunities, a Linux box displaying a Kernel Panic located a few feet away from a Windows machine requiring activation. The capacity of this building is quoted at 170 people, though that seems a little conservative given that the walkthrough video requires almost two minutes to complete. The building exit leads to a pedestrian bridge across the midway and a small pre-show room where a safety video plays on loop. The boarding process is remarkably efficient by local standards; a turnstile system allows eighteen new guests into the station at the moment the air gates close on the previous train, giving ample time for people to sort themselves into three groups of six. Today two of the three trains were in use and the staff were keeping them moving with minimal stacking. 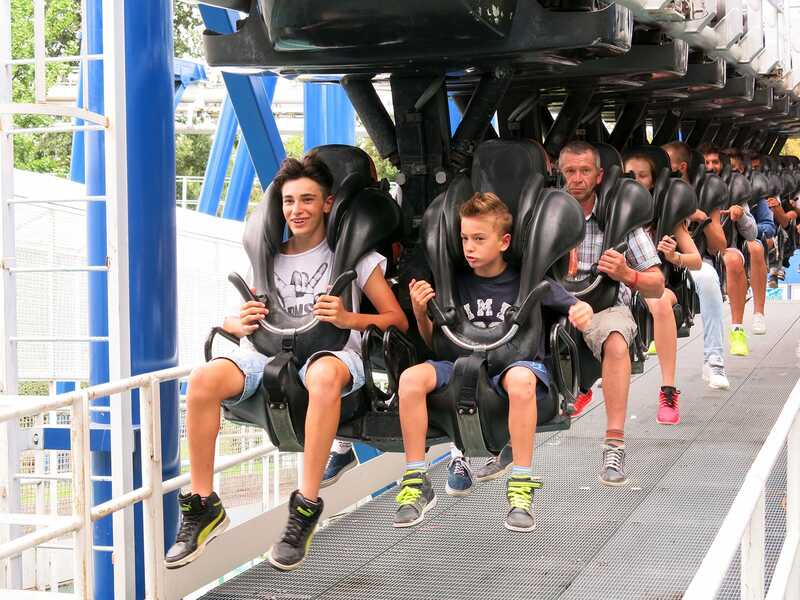 The only mild disappointment was seeing Gardaland Express users receiving priority seat selection; I'd have preferred to see those from the regular queue getting first dibs; apart from that, operations were as good as I've seen anywhere in Italy. Once dispatched the train climbs the lift hill at a normal speed for this type of ride, though the turnaround is notably quicker than the original. As expected there is a brief pause at the apex, followed by a rapid smooth drop into a tunnel, an Immelmann, an airtime hill, a helix, a heart-line roll, and the final brake. The total ride time is of the order of twenty-five seconds, which, while short, is nevertheless extremely satisfying; it's no exaggeration to describe the airtime hill as one of the best produced by B&M in recent years, hearkening back to a time when strong forces were the norm. Another ten seconds of track would have been nice, but even without it the ride is well up there with the best coasters in Italy. The theming around the track constitutes icing on what was already a delicious cake. Our second stop was at Mammut. I'd had in my head that this was an off-the-shelf version of the Vekoma mine train, given that it shares the parallel lift hills found on the five standard models, but the layout is actually quite different; a third lift, tucked away at the back of the ride, leads to a fast section of track that is surprisingly lively for this style of coaster. Six years ago there were some horrendous rough spots on this ride, but our experience today suggested rather strongly that work has been done; while the train was clunking around a bit there was nothing unmanageable and we'd have ridden a second time were there not other priorities. Eleven years ago I described the then seven year old Blue Tornado as the most uncomfortable SLC I'd experienced. Given that I was nursing a bruised rib today it would have been intelligent for me to sit it out, but I decided I'd keep my friends company in their hour of need. During the short wait Megan asked me facetiously if I thought that time would have improved the ride quality. My emphatic negative was, unsurprisingly, correct; the few minutes our group spent on board resulted in a minor if extremely localised Tourettes syndrome outbreak. As awful as the ride was, though, I couldn't help but wonder what it might be like with upgraded trains; at the very least the result might be rideable. We went from there to the back row of Raptor. I was looking forward to experiencing the prototype Wing Coaster again, not least because I was curious to see how it would hold up after a few years of operation. From my inside seat the ride quality was almost as good as I remembered, thanks in no small part to the visual impact of the various near-miss elements. There was some minor vibration, but it wasn't unmanageable and was no worse than the other B&Ms built in recent years. That being said, Megan reported a different story from the outside; an overly tight restraint apparently delivered a bit of a beating, to the point that the ride just wasn't enjoyable for her. A large number of club members moved en masse to the western boundary of the park for the final three coasters, beginning with Ortobruco Tour, an extended family coaster described in my original trip report as having six lift hills. That was (and is) a bit of a stretch; it's probably fairer to say that the custom designed ride features two lifts and four sets of booster wheels to prevent stalling. The lack of any significant height differential in the layout results in a top speed that barely scrapes into double figures, but notwithstanding that the quality of the experience is sufficiently good that it is arguably still one of the best coasters in the park. My troublesome rib came back to haunt me on Magic Mountain, the elderly Vekoma Double Loop Corkscrew that was refitted with prototype soft vest restraints a few years ago. The main drop and vertical loops presented no problems but the corkscrew element caused the restraint to apply pressure in precisely the wrong places, resulting in some choice invective on my part. There was no queue on the return to the station, but despite that I chose to forego the proffered second lap in the interests of self-preservation. That left the prototype Screaming Squirrel as the final coaster of the day. As we queued Megan announced that I was a good boyfriend for riding with her, presumably thinking back to the colourful if not exactly politically correct language she used a few years ago to describe a very similar installation in Russia. I told her that I didn't remember Sequoia Adventure being particularly bad, but equally that I didn't remember it being much good either, and honestly that's as accurate a review as any; the four seat car was kept at a low speed by trim brakes but the transitions were still negotiated awkwardly. The only really worthwhile moment was towards the end when there was a visual near-miss with a rotating saw blade; other than that the entire ride was missable. I found myself wondering, not for the first time, how on earth S&S managed to sell two other models before the product evolved into the vastly superior El Loco. With the coasters complete we headed for the Flying Island, one of just two in Europe. The lone operator on duty was quite insistent that we should sit down until his ride had left the ground, but was happy enough to let people stand once clear giving some good opportunities for aerial photography. The cycle time was very short, and as a result we ended up riding a second time to capture the shots we'd missed on our first attempt. We caught a quick lap on Oblivion: The Black Hole before heading to Space Vertigo, a 40 metre drop tower that stands slightly shorter than coaster beside it. My height was checked twice, both at the start and end of the queue, making me wonder whether the nearby spatial distortion has resulted in guests changing height in the roughly thirty seconds it takes to walk between points. I was well clear in both cases, the limit being 190cm, and was thus able to enjoy about a second and a half of freefall before the brakes caught us. Gardaland retired the popular Valle dei Rei dark ride at the beginning of the 2008 season, but kept the original building and much of the Egyptian theming for a locally-built target shooter named Ramses: Il Risveglio. The general presentation of this ride was excellent, but the calibration of the gun was decidedly hit and miss (pun intended); it was only after I began aiming two feet below the various targets that my score began to creep upwards. The park's other dark ride is the spectacular I Corsari, a Pirates of the Caribbean equivalent described in my 2005 trip report. The only interesting thing to add is that the ride machinery is buried a very long way underground; there is a substantial drop shortly after dispatch, albeit one braked to avoid a huge splashdown, and an enormous lift hill is required to bring the boats and passengers back to the station area, which itself requires two escalators to get back to the outdoors. One wonders just how much money was spent to keep what would otherwise be an enormous nondescript show building invisible even to satellites. After a meal break we found ourselves at the Magic House, a Vekoma-built rotating room that seemed somewhat less impressive today than it was a decade ago. The cartoony theming was cute, but the soundtrack was far less memorable than Kassandra or Villa Volta, and the ride programme felt very tame to me. I've since learned that this was a deliberate decision by park management who wanted a ride that wouldn't be too intense for young children, and that's fair enough I suppose, though it would be nice to have separate queues for standard and intense programmes. We were down to our last hour by this point, and we decided to use it on our favourite coaster. Rain had begun to fall at this stage, and it had gotten sufficiently heavy by the time we disembarked that we decided we'd spend a few minutes drying off on the Monorotaia monorail. This proved a tactical error; there was a thoroughly unnecessary half hour queue due to fact that the staff were running every other train empty for reasons unclear. We did get a few good overhead photographs of Ortobruco Tour, but on the whole I'd have preferred another coaster ride or three. 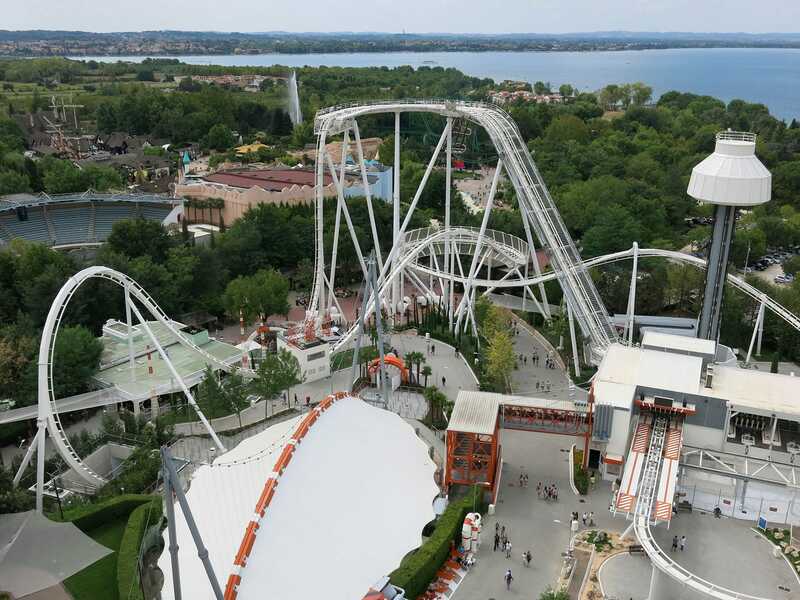 Long time readers of this blog will be aware that I've written some pretty negative things about Gardaland in the past, and I'm pleased to report that today represented a much better experience than I've come to expect. There was only one oddity that I feel compelled to document, namely a strict rationing of park maps; it was necessary to ask for them, and staff definitely didn't want to give out spares. Ben was subjected to an OVRA-style interrogation when he asked for a second one, and Megan had similar problems, though we did manage to escape with one apiece in the end!